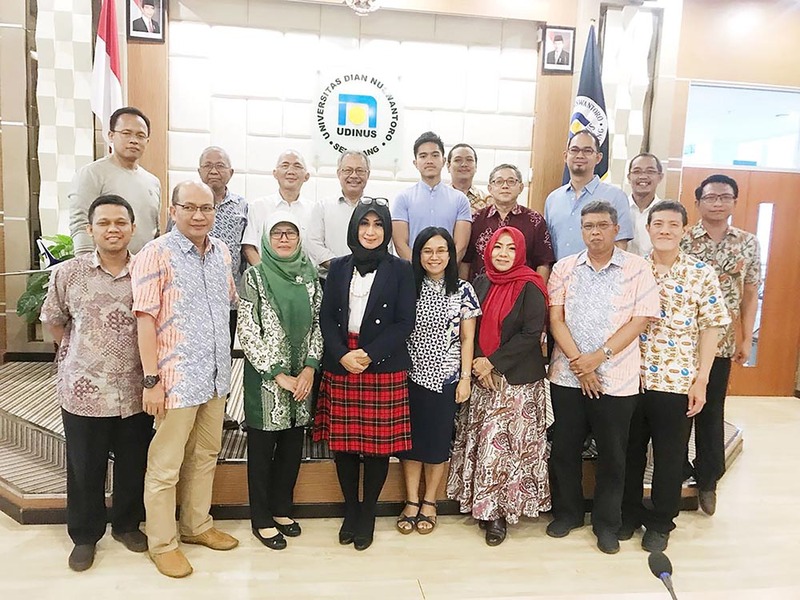 Universitas Dian Nuswantoro (UDINUS) just held a meeting to form an Independent Accreditation Institute of Information and Computer (LAM Infocom) on the first floor of H Building. The meeting was a form of UDINUS’ support for the establishment of accreditation institute engaged in informatics and computer study programs. The institute is a form of initiation from 4 organizations namely Association of Informatics and Computer Science (Aptikom), supported by Indonesia Computer, Electronics and Instrumentation Support Society (Indoceiss), Indonesian Computer Profession Association (IPKIN) and Association of Indonesian Information System (ASII). The Founding Chairman of LAM Infocom, Dr.Prihandoko, MIT said that the establishment of LAM Infocom would be able to make accreditation for informatics and computer study program in all universities in Indonesia. He said that the proposed establishment of the institute had been submitted to the Ministry of Research and Technology of Higher Education in April. "Our target is that LAM Infocom can be operated in 2019, while waiting for the initial proposal to run, we are completing supporting documents which will be needed to run LAM Infocom," he said on Wednesday May 30th, 2018. He added that there is a huge gap between universities in java and outside java. He hoped that with LAM Infocom, the gap can be eliminated "We are concerned with the gap in universities in Indonesia, especially in the field of information and computers. It can be reduced by improving the quality of education outside Java, "he said. With the establishment of LAM Infocom in the future, it can assist universities in performing verification of form corresponding that suitable with the character in the study program of Information and computer. According to him the compiler will be the expert. "We welcome and fully support the establishment of LAM Infocom. This institute will facilitate the information and computer study program in producing a more specific form, "said Dean of the Faculty of Computer Science, UDINUS, Dr. Drs. Abdul Syukur, M.M.